An agrarian archeaological expedition in search of the farro of the gods. Naked barley, stripped of its husk to be even healthier. The tradition and wisdom of ancient Mediterranean populations. 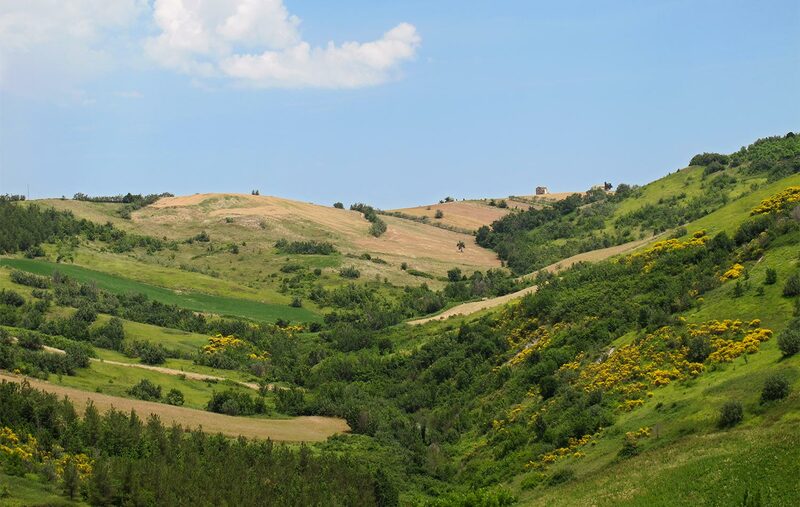 Driving through the hills of Guardiagrele in the provicine of Chieti, we are not at all surprised that the Majella park in Abruzzo is considered one of the most beautiful natural parks in all of Italy. The afternoon view in the beginning of summer is breathtaking. Upon arrival at the Caprafico Plains, Giacomo Santoleri greets us in front of his eighteenth-century manor as though we were old friends. Giacomo is the heir to this property built by his ancestors, and stands outside in his plaid shirt with the serene expression of one who has happily abandoned himself to the call of earth and origins. His agricultural destiny runs in the family; his son Peter is currently in charge of international relations. The place seems to be pulled from another time. 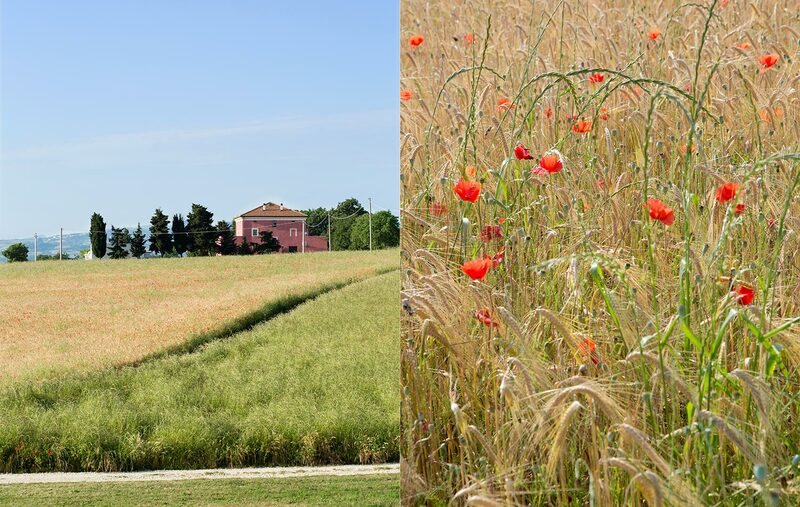 Poppies grow in the midst of fields of grain, and the Pompeian red of the ancient manor house sets it elegantly apart from the surrounding forest and fields. Giacomo is a “repentant engineer destined for agriculture,” as he defines himself. He once believed that electrical engineering was his calling, and he left these Abruzzese hills behind him for a life in the capital in the 1970s. The untimely death of his father Giovanni called him back to his homeland. In the beginning, the double life was tough for Giacomo. He divided time and energy between his career in Rome and the olive plants at his home in Abruzzo. In his free time, he traveled Rome from end to end, proposing his olive oil to shops and restaurants all throughout the city. In spite of the store’s pure Roman style, the managers were from Umbria. They introduced him to the origins of farro (also known as emmer wheat), an ancient grain already known by the populations of Mesopotamia that played a fundamental role in the health of ancient Romans. It once served as a valuable source of nutrients for the legionaries as well as an integral ingredient in matrimonial propitiary rites. In fact, the very word for “flour” in Italian, farina, is derived from farris, or farro. It was a revelation: Giacomo knew what he would cultivate in his fields, and how he would be able to make a difference. With the help of a European Community incentive in the 1980s, Giacomo was able to leave Rome to follow his dream of returning those ancient grains that had once been so important to the Mediterranean diet to their former glory. He embarked on a journey in search of farmers who still kept their secrets of ancient grains safe and, more importantly, the seeds! Finally, about 40 km from home in Montenerodomo, he found his treasure: a native Abruzzese farro that had remained unchanged over the centuries, because it was only ever intended for livestock feed. It is a variety of Triticum Dicoccum similar to wheat in its dietary uses, but with a significantly lower percentage of gluten, making it therefore more tolerable. 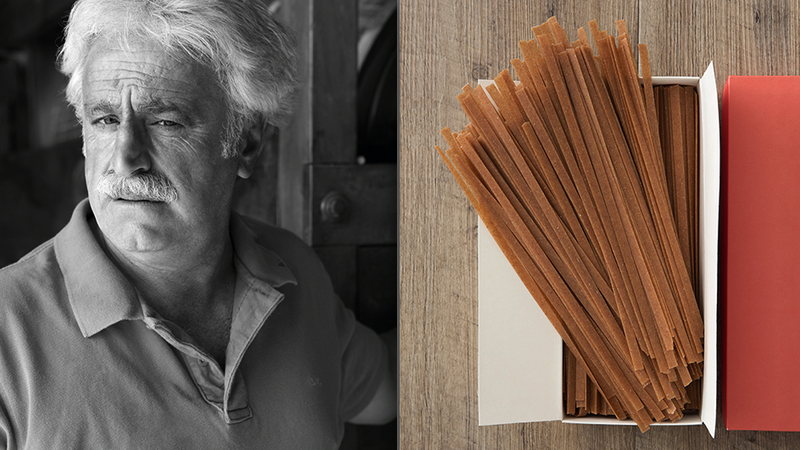 The passionate cultivation of this almost mythological cereal along with his olives, legumes, and other traditional crops such as barley “mondo” has allowed Giacomo to farm without pesticides and other synthetic chemicals to produce a small collection of valuable niche products, absolutly unique in quality and taste. Barley “mondo” is a husked variety of the grain, recovered from oblivion in recent years for its excellent nutritional properties. His pasta Ma’ Kaira is particularly special. Its name comes from the Grecian word makaira, a precursor to the Latin maccherone, or “macaroni,” and it is made from farro and barley that have been cultivated according to ancient traditions of the Mediterranean populations. The grains are stone-ground and naturally healthy, keeping cholesterol in check and energizing the body and mind (just think that in ancient Greece, barley was considered the food of philosophers). Above all, it is delicious. “Hanging up my laurels brought me my fortune,” says Giacomo. We couldn’t agree more.